October 2011 issue on sale today! | What Hi-Fi? October 2011 issue on sale today! Our October issue, on sale today, is packed with 170 pages of top tech. As we plan for our special Awards issue on October 21st, we have a bumper First Tests section bulging with all the latest hi-fi and home cinema kit for you to drool over. We take an exclusive listen to the Q Acoustics Q7000 surround speaker package, Acoustic Energy's Compact 1 stereo speakers, an impressive 24in LCD TV from Panasonic, Monitor Audio's new i-deck 100, another powerful AV receiver from Onkyo – the Spotify-enabled TX-NR709 – and NAD's excellent C446 music streamer. There's more. Denon's upmarket DBP-2012UD Blu-ray player gets the full test treatment, as does Sony's £300 STR-DH820 home cinema amplifier, Samsung's super-stylish UE55D8000 3D TV, Wharfedale's new Jade-5 floorstanding speakers and Dali's Zensor 5s. Oh, and we've got a digital iPad dock from Cambridge Audio, the £150 iD100. Moving on to this month's Supertest, we've rounded up seven high-tech 40-42in TVs with stunning pictures and web streaming, from just £475. Panasonic, LG, Samsung and Sony battle it out for top honours. Elsewhere in the issue, five all-in-one micro music systems deliver stellar sonics from £300, and six soundbars go head-to-head in our £180-£800 shootout. For those of you who can accommodate a full-blown surround system, there's a Group Test of four home cinema amplifiers: Denon's AVR-1912 vs Onkyo's TX-NR609 vs Pioneer's VSX-921 vs Yamaha's RX-V671. And should you be in the market for a chunky 5.1 speaker package to make the most of your AV amp or receiver, we pitch our long-running favourites, the Monitor Audio Silver RX6 AV12, against the Acoustic Energy Radiance 2 5.1, KEF Q300 5.1 and Tannoy Revolution DC6 T.
Win a Cyrus StreamlineWant more? Then check out our Temptations section in which we take a long, hard look at and listen to Wadia's £14,000 S7i CD player and a pair of colossal standmount speakers from Spendor, the SP100R2s. In Playlist we review our first 'app' album, Bjork's extraordinary Biophilia, while in Insider we ask "What's next for 3D?". And three readers get to answer The Big Question: "With budget Blu-ray players being so good, why spend more money?" And don't forget you could win a Cyrus Streamline music streamer in our exclusive competition here on whathifi.com. 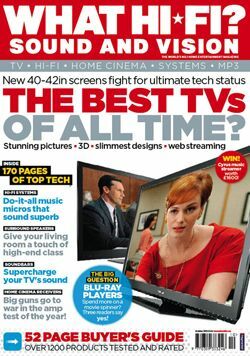 All this and more is in the October 2011 issue of What Hi-Fi? Sound and Vision, on sale now at all good newsagents. Or download our digital edition straight to your laptop, PC or iPad. Happy reading!